I'm so glad you found your way onto my Photography Basics series. I have taught the basics of photography to millions of photographers around the world through Improve Photography, so I know just exactly how difficult it can seem to learn the basics of photography. My goal is to make this Photography Basics series the absolute simplest way to learn the basics of photography. I hope you'll love this series because of what you learn here, and I hope you'll join the Improve Photography community after you get your feet wet with the photo basics. Let's get going. You can do photography with even the simplest of cameras, but the principles that I'd like to teach are for people who want to learn to use a DSLR camera, a micro four-thirds camera, or at least a camera that allows the photographer to adjust the shutter speed, aperture, and ISO. Even some pocket cameras have this functionality. Now that you have your camera, it is time to learn exposure. When photographers talk about “exposure,” we simply mean the brightness or darkness of a photo. It seems simple enough to take a photo that is correctly exposed (has the proper brightness or darkness), but in reality it can be quite the trick. 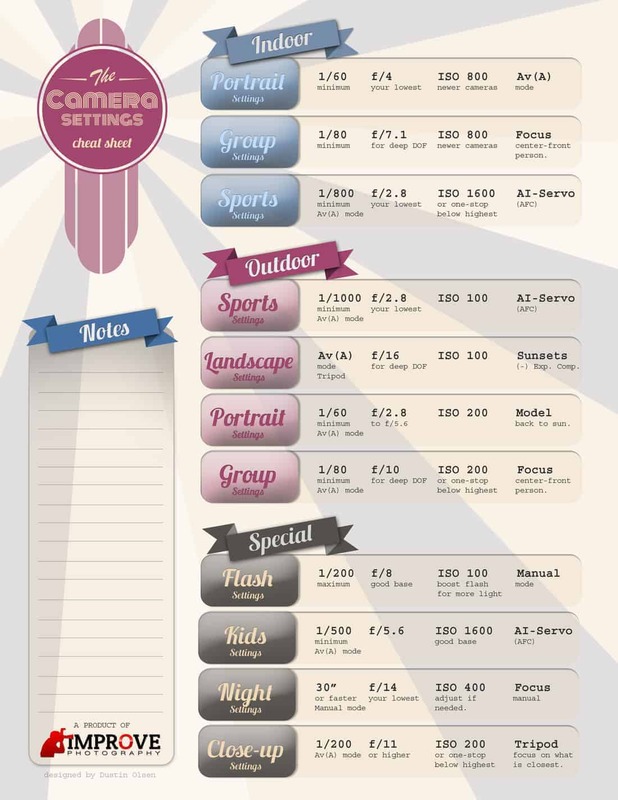 To help get the right exposure with your camera settings – you can download this Camera Settings Cheat Sheet guide. If you're reading this Photo Basics series, it probably means that you currently shoot on the “Green mode” of your camera–or the automatic setting. That means the camera entirely controls the exposure of the picture. When you shoot on automatic mode, your camera selects an aperture setting, an ISO setting, a shutter speed, and a host of other settings for you. Automatic can be handy, but it also seriously limits your creative ability to make a beautiful picture. Want proof that automatic isn't the best way to shoot? Check out the picture below. On the left, the picture was taken entirely in automatic mode on a Canon Rebel DSLR. That might look okay to you… until you see the picture on the right. Same sunset. Same camera. The pictures were taken only seconds apart. The difference? The picture on the right was taken using manual exposure. The only difference between these two pictures is that one was shot with automatic exposure, and the other was shot using creative exposure. Which photo do you prefer? Probably the picture on the right! By choosing a creatively dark exposure, the rich colors in the sunset were allowed to shine through. However, technically, the photo on the left is “correct,” and the photo on the right is “incorrect.” The camera saw through the lens and tried to expose the bird so that it wouldn't become a shadow. To me, the photo was not about exposing the bird properly, but exposing the sunset properly. The bird was just a nice shape to include in the foreground. This is exactly why you must learn exposure–because sometimes the “scientifically correct” exposure is not the best exposure to make the photo look how you want it to. Now that you understand why it is so important to take control over the exposure, let's move on to lesson #2 where we'll learn all about shutter, aperture and ISO–which are the tools you need to control the exposure. Keep reading for the next 10 or 15 minutes and you'll already understand the basics of how to shoot in manual mode on your camera. I promise shooting in manual mode isn't nearly as scary as you might think. Once you're ready to learn to shoot in manual mode, get tack sharp focus, and master lighting, please consider buying my Photography Start video series. It's a series of 22 video tutorials where I walk you step-by-step through the things that it normally takes my photography students two years to learn. I've priced it at a REALLY reasonable price so you can get a good solid start in photography. Hi. Is there any way to get the Cheat Sheet as a pdf link? I could not print out the image that comes up on the link. I just got the upper right corner. Thanks! Looks like this site has a lot to offer. I can’t wait to check out more. My self Gaganpreet singh from punjab (india) & m passionate about wild life & Nature photography. please guide me .. what should i do . i hv done b.sc in media &film technology.. knwldge about photography . Yet i hv canon powershot which in.unprofessional camera… plz read n reply me. Good tutorial., and this is very useful and really really helpful for me. Your website is fantastic; what a learning experience! Your podcasts have completely changed my photo-taking perspective –I am now into this and have become a convert: I really want to become a good photographer. As a retired lad, I now have this goal to work towards. I will be signing up for your classes. One question: In episode 72 on Action Photography, you discussed setting the camera to 9 Auto-focus points. In the discussion, you indicated the Nikon D7100 was not a camera to do this in. I was wondering why. It has Dynamic-Area AF which can be set to 9, 21 or 51 AF points (for ƒ5.6 or larger)- and even has a 3D-Tracking mode. I have used the latter to good effect with the CH-release mode and continuous-servo AF (AF-C) in capturing birds in flight. Could the 3D mode be used to advantage in capturing high speed action shots? Great tutorial thank you. as a newbie in photography many of these terms was difficult for me to understand your way of explaining is the best i could find. it’s really simple so thank you again. Great information! 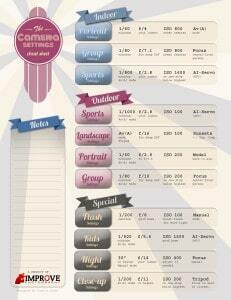 Very applicable and easy for the beginners to understand the basic concepts of photography. Thanks for this great information and sharing it to everyone. I am just a beginner in photography world and luckily come across your blog which is very useful for me to understand the basic tips for taking good photography. Finally … My new Favorite website. I have been hunting high and low trying to find a site that explains the art of photography and unravels the complexity of Manuel. I have a bit of add, ocd and am a visual Learner. With that being said, you are talking my language on this website. Thank you SO VERY MUCH. I love this blog. Thanks so much for taking the time! I had learned all of this stuff a long time ago and had completely lost it. This is the only blog that kept me from getting more confused. I was wondering if you remembered what the different settings were that you used for the picture on the right on the first page? Thank you for your basic lessons it was really useful to me.. Thank you for the useful information you kindly provided. I’m quite impressed about the information you’ve provided, so much so that I’ve purchased your course. Is it important to buy an expensive camera in beginning? I don’t think so but what if I purchased a cheap camera and after buying it I realized that it’s not the right camera for me. I want to buy my first camera but totally confused. Help me please. I cannot read your Camera Settings Cheat Sheet. The captions are hard to read. Do you have an original on hand? I’m having problems using manual focus. The shots appear and get really blurry. What am I doing wrong? I did play with aperture, ISO and shutter speed settings. Is there a base level for use to avoid it? Hi Alex! My name is Sophia! I love photography and I take some pretty awesome pictures but the only problem is I don’t have a camera I just use my iPhone 6… So I don’t know what camera to get. There are so many and since I’m rookie I was wondering if you could give me some suggestions and input for picking out my camera.